by boat on 28 May 1842. They stayed in the Via Dataria, near the Quirinal Palace. He and Fr Poupinel had audiences with Pope Gregory XVI on 15 June and 6 August. Since his first visit to Rome in 1833, Fr Colin had been elected Superior General at the first General Chapter of 1842. The Society now numbered some 400 brothers, 100 sisters and 100 priests, as well as groups of lay Marists. By this time, the Founder of the Marist Brothers, St Marcellin Champagnat, had died in 1840, and forty-one of the brothers and priests were missionaries in Western Oceania, the mission field for which the Society became responsible when the priests’ branch of the Congregation was approved by Pope Gregory XVI in 1836. There were three main issues that Fr Colin wanted to present to Church authorities. The first was the notion of a multi-branched congregation: priests, sisters and brothers all under one authority. In three separate documents, Rome had already rejected this idea. The second matter to be dealt with was the mission in the Pacific: the difficulties encountered included men ill-equipped to deal with the new cultures in which they found themselves; the slowness and irregularity of communication over the vast territory of the mission; and the immense financial costs, made worse in 1840 by the bankruptcy of the London bank which held most of the Oceania mission money. As well, the relationships between Fr Colin and Bishop Pompallier, and Bishop Pompallier and the missionaries, had gone from bad to worse. The third subject to be dealt with was the Rule and Constitutions of the Society. When he had been in Rome in 1833, Fr Colin had met a number of Jesuits, two of whom were to be of great help to him. One of them, Fr Jean Rozaven, was well-versed in Canon Law and was an advisor to the Holy See. The other was the Superior General of the Jesuits, Fr Jan Philip Roothan. 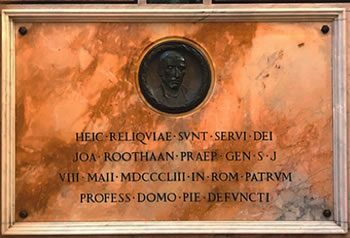 Tomb of Fr Jan Philip Roothan S.J. During his 1842 visit, Fr Colin visited Fr Jan Philip Roothan a number of times. 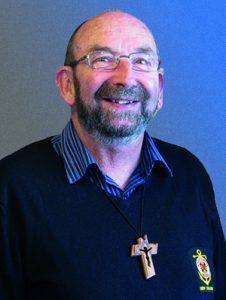 Of him, Fr Colin said, “I found in the Jesuit General an unreserved confidence and a frankness which pleased me greatly. He was as open and frank with me as the others were reserved” (A Founder Speaks, 60:41). Frs Roothan and Colin became life-long friends. 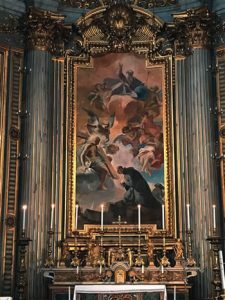 Fr Colin was introduced to the Constitutions of the Society of Jesus for the first time by Frs Rozaven and Roothan at the Casanatense Library, which had been founded by Cardinal Girolamo Casanata and opened in 1701. 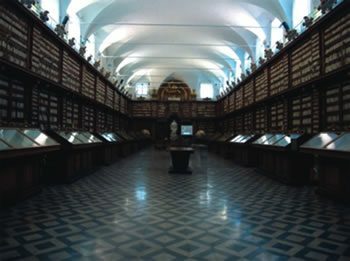 Since 1872, the Casanatense Library has been managed by the Italian government. It contains about 400,000 books, manuscripts and incunabula. 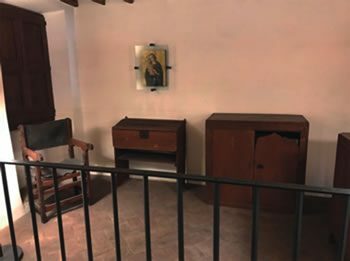 The Jesuit Constitutions provided a framework for the material Fr Colin had written at Cerdon, his home in France. 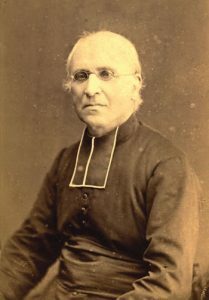 While it is true that some of Fr Colin’s 1842 Constitutions resemble those of the Jesuits, the Founder adopted a ‘Marist’ approach to such items as fidelity to the Holy See, devotion to Mary, learning and its relation to holiness, humility, the love of silence, and the approach to the apostolate. 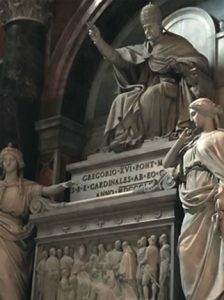 The Church of the Gesù, the Mother Church of the Jesuits, is where the tombs of St Ignatius and St Francis Xavier are to be found. Fr Colin visited this church many times. 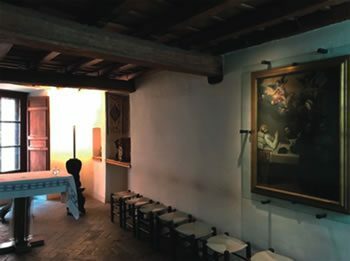 The three rooms in which St Ignatius lived, worked and died, have been preserved, and are part of the Jesuit community building next to the Church of the Gesù.